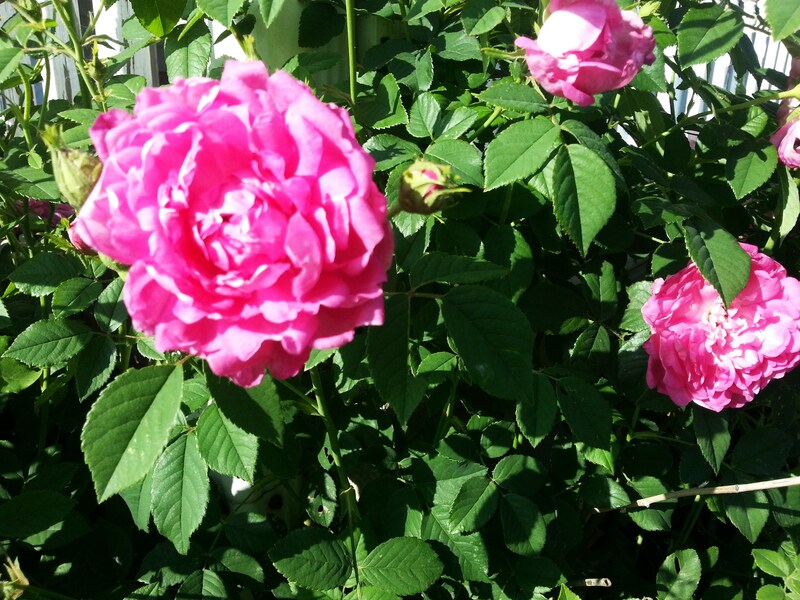 Grandma’s Rose Bush….1940’s to Now…..Living Forever… – …………. ''AND LET THE FUN BEGIN''…………….. Here it is at 6am in the morning and the temperature is 28 degrees……..brrrrrrrrrr………We are just 9 days away from leaving. This cold snap horrible. It is even chilly in Harlingen. 58 degrees….lol….but we can handle that. Were just hoping the snow doesn’t fly before we leave. lol. Were having our family Thanksgiving at Scott and Brandys, on the 22. It will be our last family gathering till next summer. Then we plan on leaving on Sunday 23. That gives us a week to get to Harlingen Texas. We can take out time and enjoy the trip. But if it is bad weather and snowing….OH NO….we will head straight south. To the Sunshine and warmer weather and then turn west. We’ve made a few more trips to Goodwill and Lily Pads. Sold more stuff on Facebook Garage Sale sights. Gave more stuff away. Yesterday, I went through the cabinets in the kitchen. All those bowls and lids. I seen on Facebook recently, a funny post. “Did you know that all those socks that go missing in the dryer, turn into Tupperware Lids”? ……Hahahaah…….That’s why I found all those lids in the cabinet. Now I know where they come from. I guess I am never to old to gain more knowledge. But still have lots of stuff……Will it never end?…. When I was a little girl, I lived with my Grandma for 2 years when my parents split up. I was in 4th and 5th grade. I have so many memories. She lived in an old 2 story house. I loved it. It seemed so big but I bet it wasn’t. Seems like when your a little kid everything is so HUGE!! !….When you grow up everything becomes much smaller. I have so many memories of this house. Waking up in the morning, (of course had to tryout every bedroom in the house, up stairs or down) smelling fresh percolated coffee filtering the air. Sitting on the front porch whether, I was swinging or just sitting on the wooden steps. I would love to watch the cars go by. She lived on Main St. in Kewanee. I can still see her cutting her grass with the push mower, hanging her laundry on Monday, wash day. The whole back yard was full of sheets and clothes hanging with the poles holding the lines up. She did her laundry down basement in the wringer washer and the old washtubs. She had a sistern with a hand pump for water and huge crocks of water. She also had a coal bin down basement. In the winter she would have to get up in the middle of the nite to stoke the furnace with coal and corn cobs. She had a beautiful garden in the backyard. It was full of fruit trees, bushes, flowers, and vegetables. She grew all kinds of veggies in her garden and canned them. She also had cherry trees, apple trees, and peach trees. Raspberry bushes, red and black, and currant bushes. She even had a grape arbor. Flowers were everywhere. I remember her beautiful red poppies that came back every year. I would come home from playing and I would go to the back yard behind the garage and find her picking the berries. Of course they were all sticker bushes, so she had long sleeves and a net on her hair. She canned everything she grew. Ohhh How she could cook. She had around 11 brothers and sisters, so when they came to visit, everyone had to go see the garden, and what wonderful aromas and food came from her kitchen. Ohhhh the jams and Jellies she could make. Grandma had the old stove with the cast iron lids on the top. On the left side was the area to put in coal or wood to fuel the stove and on the right was the oven. Extending up on the back was the warming area and a shelve for salt and pepper. the cast iron lids had a removable handle that you interchanged from lid to lid to open the stove area. This is where she would brew her coffee. (So what happened to me? lol I love the smell of coffee…..Brings back these memories….But can’t stand to drink it.) But the one thing I remember most is her ……OLD FASHIONED ROSE BUSH….. It was planted against the back of the old garage. It bloomed only once a year at the end of May. It was just covered with beautiful Pink flowers. It would get so big that she would tie it up. The branches would grown long and arch out and bend to the ground from the weight of the flowers . This picture is from the 1940s. I also have a picture of my Grandfather standing beside it. He died in 1949 before I was even born. 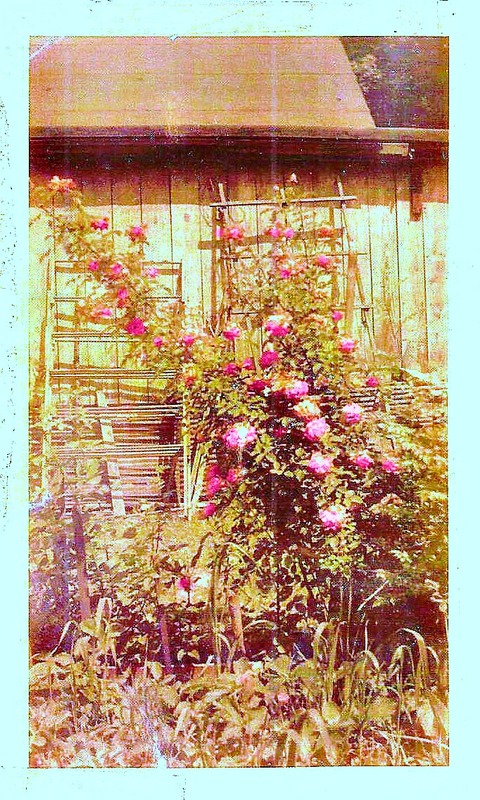 When my mom was married, she took a piece of the rose bush everywhere she moved. Burlington, little town of Cameron, country house in Cameron, and finally Toluca. All the bushes I believe are now gone. When Rich and I were married and moved here to this house, I took a piece from my childhood house in Toluca. It just flourished on the north side of the house. When we added on to the back I had to replant it again on the west side of the front porch. Their it is today. Growing like crazy. My sister from Albuquerque came for a visit, a number of years ago and took a piece home with her. Then she gave a piece to her son in Santa Fe New Mexico. It is still growing at both homes. Now in the spring, when we return, I will be starting more pieces of it at both the girls homes and my sister in law, Connie is anxiously waiting for a piece also. Connie has a beautiful yard. She has put so much time and energy into it. She has a green thumb. Connie and Brian bought her dads home, and I know she spends her time sitting on the back porch and reminiscing also. Leo put a lot of time into his garden. So a Rose bush in her yard will make a Beautiful addition. 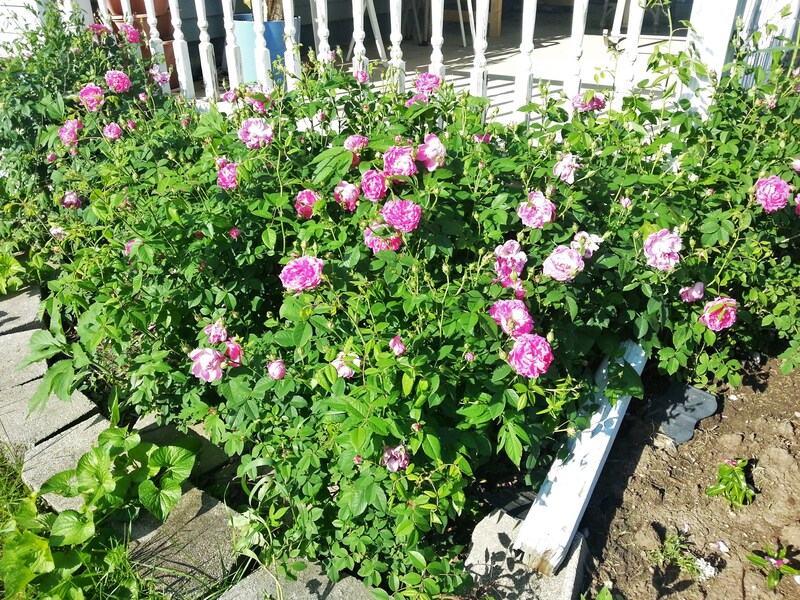 So this little Rose Bush is still growing and flourishing in Albuquerque and Santa Fe New Mexico and McNabb Ill. Next spring it will also be growing in Spring Valley, Granville and little Mt. Palatine. All since the 1940s. What a history. 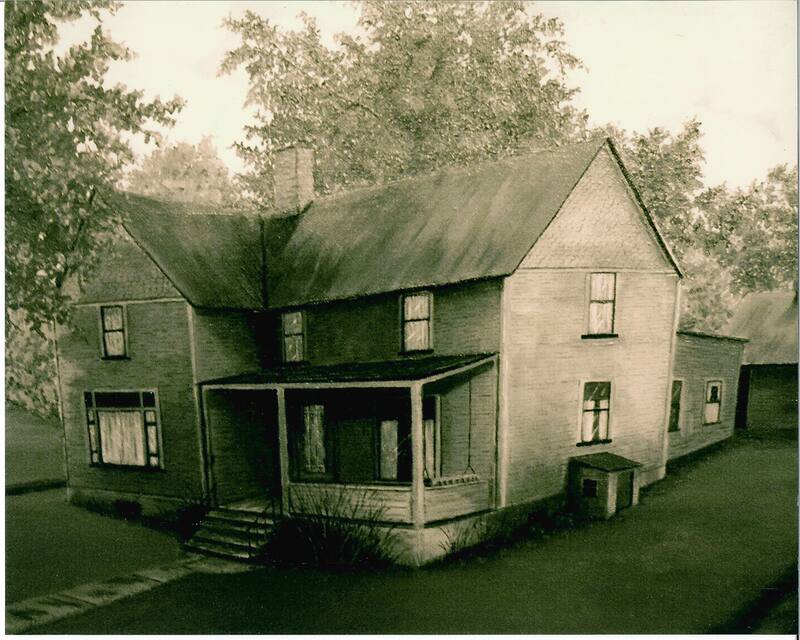 It may be much older as my Grandma moved to her home in the early 1920s after she was married. The picture that I have of my Grandpa is how I am giving the Rose Bush its age. My Grandpa died the year before I was born, 1949. Hopefully the Bush will live on and the kids will all follow tradition and keeping passing a little piece of this bush on………What a Great Legacy….. Some more pics of the Rose Bush and some other flowers in my yard. Of Course , I have to end this blog with a pic of Kitty in the window…..Hes been around for a long time…. Ps…….The sun is up……….will not really…its just daylight…….OMG…Their is a Dusting of SNOW ON THE GROUND…………..
← The Alarm Clocks are now Officially……………OFF…………..
Wow, what a beautiful story. You are so great at writing Margaret. Have a safe trip. Roberta, these are all things that i believe should be remembered after we are all gone and past one for the next generations…I have so many memories and stories from my grandmother as we all do. We are the last ones left and the memories will be gone. What a better way to remember the past and the present other than writing . Hopefully they will be shared with the kids and families in future generations…..
Roberta, I live on a mid century condo complex in Atlanta, built in 1947, and we had a 1940’s rose bush that was IDENTICAL to yours! I sadly report that we “had” bc 2 new homeowners, for reasons no one understands, ripped it up and threw it out! This has me, and others, quite upset. 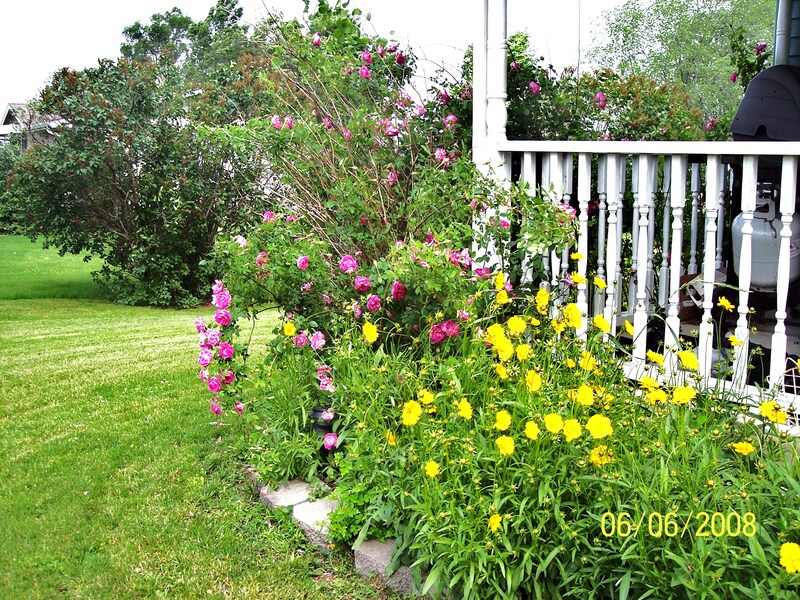 It was a beautiful rosebush, that we was one of us, and gave each of us so much joy every May with its full blooms. I see in your article that you took a few clippings from your grandmother’s bush. HHHmmm…. maybe I can find another in Atlanta and sneak into someone’s yard for a snip;0) Though our original babe could never be replaced. Thx for your blog, I so enjoyed it.